Appellate courts across the United States have recognized the dangerousness of the pit bull breed since the mid 1980s. We've listed excerpts from high court decisions that demonstrate this. That each Defendant's dogs are of the breed that is typically referred to generically as pit bull dogs which are aggressive by nature, have been known as attack animals with strong massive heads and jaws, and have been found to represent a public health hazard. The Majority of jurisdictions have accepted the proposition that dogs of this type have a propensity to be aggressive and attack without provocation and it is well established that such dogs have gotten a lot of notoriety of being dangerous to public health and safety. We are modifying the Maryland common law of liability as it relates to attacks by pit bull and cross-bred pit bull dogs against humans. With the standard we establish today (which is to be applied in this case on remand), when an owner or a landlord is proven to have knowledge of the presence of a pit bull or cross-bred pit bull (as both the owner and landlord did in this case) or should have had such knowledge, a prima facie case is established. It is not necessary that the landlord (or the pit bull's owner) have actual knowledge that the specific pit bull involved is dangerous. Because of its aggressive and vicious nature and its capability to inflict serious and sometimes fatal injuries, pit bulls and cross-bred pit bulls are inherently dangerous. 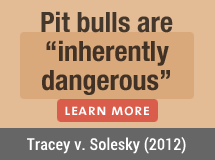 The trial court cited the substantial evidence supporting its conclusion that pit bulls, compared to other breeds, cause a disproportionate amount of danger to people. The chief dog warden of Lucas County testified that: (1) when pit bulls attack, they are more likely to inflict severe damage to their victim than other breeds of dogs; (2) pit bulls have killed more Ohioans than any other breed of dog; (3) Toledo police officers fire their weapons in the line of duty at pit bulls more often than they fire weapons at people and all other breeds of dogs combined; (4) pit bulls are frequently shot during drug raids because pit bulls are encountered more frequently in drug raids than any other dog breed. The trial court also found that pit bulls are "found largely in urban settings where there are crowded living conditions and a large number of children present," which increases the risk of injury caused by pit bulls. The evidence presented in the trial court supports the conclusion that pit bulls pose a serious danger to the safety to citizens. The state and the city have a legitimate interest in protecting the citizens from the degree of danger posed by this breed of domestic dog. Even the perception of loyalty may be unwarranted. In June, a twelve-year old boy was mauled to death in San Francisco by his family's two pit bulls ... That same month a Bay Area woman suffered severe injuries in an attack by her nine-year old pit bull ... A St. Louis man was killed in May by his two pit bulls that had "no apparent history of aggression and [were] described as well kept." Pit bulls have a reputation for vicious behavior that is borne of experience. The extreme dangerousness of this breed, as it has evolved today, is well recognized. "Pit bulls as a breed are known to be extremely aggressive and have been bred as attack animals." Giaculli v. Bright, 584 So.2d 187, 189 (Fla.App. 1991). Indeed, it has been judicially noted that pit bulls "bit[e] to kill without signal" (Starkey v. Township of Chester, 628 F. Supp. 196, 197 (E.D. Pa. 1986)), are selectively bred to have very powerful jaws, high insensitivity to pain, extreme aggressiveness, a natural tendency to refuse to terminate an attack, and a greater propensity to bite humans than other breeds ... ("pit bull dogs represent a unique public health hazard ... [possessing] both the capacity for extraordinarily savage behavior ... [a] capacity for uniquely vicious attacks ... coupled with an unpredictable nature" and that "[o]f the 32 known human deaths in the United States due to dog attacks ... [in the period between July 1983 and April 1989], 23 were caused by attacks by pit bull dogs"). Pit bull dogs have even been considered weapons. The American Kennel Club does not recognize the breed and publishes no conformation standards on the pit bull dog. In the pretrial hearings in the case at bar, it was established that the American Kennel Club does not register pit bulls because of their unsavory tendencies. Therefore, the pit bull is not a recognized breed for the very reason that it must be regulated: it poses a grave and inordinate danger to human health and safety. The trial court found that pit bull attacks, unlike attacks by other dogs, occur more often, are more severe, and are more likely to result in fatalities. The trial court also found that pit bulls tend to be stronger than other dogs, often give no warning signals before attacking, and are less willing than other dogs to retreat from an attack, even when they are in considerable pain. Since ample evidence exists to establish a rational relationship between the city's classification of certain dogs as pit bulls, and since there is a legitimate governmental purpose in protecting the health and safety of the city's residents and dogs, the trial court correctly concluded that the ordinance did not violate the dog owner's right to equal protection of the laws. The trial court found that pit bull breeds are known for a unique combination of strength, agility, tolerance for pain, and aggressiveness. The court also found that pit bull breeds were historically bred for fighting and killing other animals, that both Salt Lake City and North Salt Lake City have experienced a proportionately higher number of bites and attacks by these breeds than by other breeds, that Animal Control treats pit bull breeds differently than other breeds, and that because of their reputation, these breeds are often acquired by people with the intent of making the dogs mean and aggressive. Plaintiffs do not challenge these findings. Although it may be true that not all pit bulls are dangerous, the evidence supports the conclusion that, as a group, pit bulls are dangerous animals. However, it is not necessary that pit bulls be declared vicious per se under the law in order for the landlord and owners to be placed on notice that a tenant has a vicious dog. Pit bulls as a breed are known to be extremely aggressive and have been bred as attack animals. See State v. Peters, 534 So.2d 760 (Fla. 3d DCA 1988), rev. denied, 542 So.2d 1334 (Fla. 1989), upholding an ordinance of the City of North Miami which required pit bull owners to carry insurance, register their pit bulls and confine the dog indoors or in a locked pen. The City of North Miami's ordinance notes that pit bulls have a greater propensity to bite humans than all other breeds, that they are extremely aggressive towards other animals and have a natural tendency to refuse to terminate an attack once it has begun. At the hearing regarding the ordinance's constitutionality, the trial court was presented with evidence which established that the specific breeds targeted by the ordinance possess inherent characteristics of aggression, strength, viciousness and unpredictability not found in other dog breeds. The evidence indicated that, unlike other breeds that retreats if they are injured in a fight or an attack, a pit bull will often bite, clamp down with its powerful jaw, and maintain its hold until separated from its victim. The evidence also indicated that the pit bull is an exceptionally strong and athletic dog which requires extraordinary measures for confinement (e.g., six-foot-high enclosed fences). Pit bulls have exceptionally strong bites and have been known to destroy sheet metal panels by ripping them apart with their teeth. Moreover, the evidence submitted by the city illustrated numerous cases of severe maulings and deaths that have occurred in Cincinnati as a result of pit bull attacks, and attributed the majority of fatal dog attacks nationwide to pit bulls. In the present case, the district court found that pit bull dogs represented a unique hazard to the public safety, and the city ordinance regulating the ownership and possession of these dogs was therefore reasonably related to a legitimate governmental objective. The evidence introduced at trial supports this conclusion. Defendant city introduced expert testimony that pit bull dogs are both more aggressive and destructive than other dogs. Pit bull dogs possess a strongly developed "kill instinct" not shared by other breeds of dogs. This testimony indicated that pit bull dogs are unique in their "savageness and unpredictability." Research indicates that pit bull dogs are twice as likely to cause multiple injuries as other breeds of dogs. Moreover, the injuries inflicted by pit bull dogs are far worse that those inflicted by other breeds. One witness, testifying as an expert on trauma injuries, testified that pit bull dog attacks inflicted injuries much more horrific than those in other dog attacks and were comparable, in his experience, only to those injuries inflicted in attacks by lions. The district court was also presented with a survey of 278 dog attacks indicating that a majority (54.1%) represented attacks by pit bull dogs. Of the 32 known human deaths in the United States due to dog attacks since July 1983, 23 were caused by attacks by pit bull dogs. United States District Court, S.D. Ohio, W.D. Pit Bulls also possess the quality of gameness, which is not a totally clear concept, but which can be described as the propensity to catch and maul an attacked victim unrelentingly until death occurs, or as the continuing tenacity and tendency to attack repeatedly for the purpose of killing. It is clear that the unquantifiable, unpredictable aggressiveness and gameness of Pit Bulls make them uniquely dangerous. Pit Bulls have the following distinctive behavioral characteristics: a) grasping strength, b) climbing and hanging ability, c) weight pulling ability, d) a history of frenzy, which is the trait of unusual relentless ferocity or the extreme concentration on fighting and attacking, e) a history of catching, fighting, and killing instinct, f) the ability to be extremely destructive and aggressive, g) highly tolerant of pain, h) great biting strength, i) undying tenacity and courage and they are highly unpredictable. While these traits, tendencies or abilities are not unique to Pit Bulls exclusively, Pit Bulls will have these instincts and phenotypical characteristics; most significantly, such characteristics can be latent and may appear without warning or provocation. The alarming rise in fatalities and severe maulings of people by pit bull dogs has caused several municipalities and states to consider or adopt legislation limiting or prohibiting the sale or possession of pit bulls ... The physical characteristics of pit bulls, the historic use of the dogs as fighters, and the increasing number of unprovoked and unexplained attacks on people has caused the pit bull to be perceived as presenting a threat of danger, warranting a legislative response. Id. at 1075-1076. There can be no doubt that dogs in general are legitimate objects of the state's police power. Almost a century ago, the United States Supreme Court held that dogs are "subject to the police power of the State, and might be destroyed or otherwise dealt with, as in the judgment of the legislature is necessary for the protection of its citizens." As a complement to the testimony regarding specific incidents, the Village also presented evidence establishing that the American Pit Bull Terrier breed possesses inherent characteristics of aggression, strength, viciousness and unpredictability not found in any other breeds of dog. The testimony indicates that American Pit Bull Terriers are frequently selected by dog-fighters specifically because of their extraordinary fighting temperament. In a fight or attack, they are very aggressive and the most tenacious dog of any breed. They continue their attack until they are separated or their victim is destroyed. Unlike other breeds of dog that "bite and slash" in an attack, pit bulls will "bite and hold," thereby inflicting significantly more damage upon their victim. "WHEREAS, after consideration of the facts, this Council has determined that the following Ordinance is reasonable and necessary for the protection of the public health, safety and welfare." 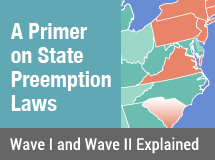 The findings recited in the ordinance are unchallenged. While pit bulls have their defenders, see Hearne, Lo, Hear the Gentle Pit Bull!, Harper's, June 1985, at 59, the City's choice to regulate pit bulls cannot be said to have been arbitrary or irrational. "Pit Bulls are considered dangerous dogs and potentially hazardous to the community..."
The Township could reasonably determine, as it did, that Pit Bulls are dangerous. The Township's Health Officer testified that the regulation was necessary in this densely populated Township; the Pit Bull bites to kill without signal. The Township does not have to regulate every dangerous animal at the same time in the same way to pass constitutional muster. The Township has not gone too far, insofar as the present record shows in regulating, licensing and charging fees for Pit Bulls.